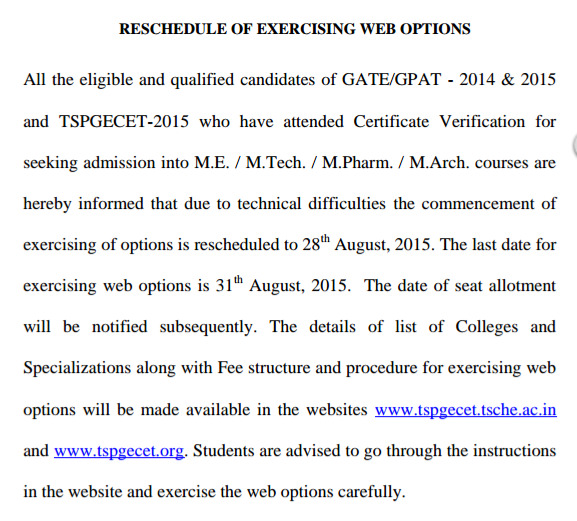 Telangana PGECET 2015 qualified candidates to attend Certificate verification for Admission into M.E /M.Tech /M.Pham . / M.Arch. Courses .The commencement of option is rescheduled to 28-08-2015. The date of seat allotment will be notified subsequently. Students are advised to go through the Institutions in the website and exercise the web Options carefully.